With 125 years of knife production and knowledge, Morakniv is another popularly recognized knife company. 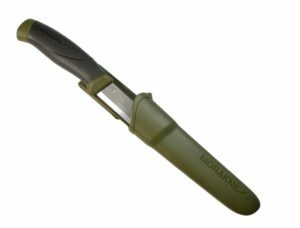 The Mora Companion MG review shows a military green, is among the top selling products this company has to offer. It performs extremely well, holds a consistent edge with heavy work, and comfortable to hold without chaffing or blisters developing. Handle Material: Black Hard Rubber With Military Green Plastic. 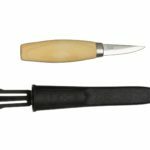 This Mora product is accompanied with a plastic military green sheath with a belt clip attached. Altogether, its full weight, with sheath, comes to 3.9 ounces. Removing its sheath, the mora companion mg alone is a very light 2.7 ounces, just enough to remember it’s hanging from your waistline but easily maneuverable in hand. 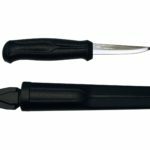 Sporting a hard rubber handle for optimal precision cutting, this knife creates accurate manipulation for its user. 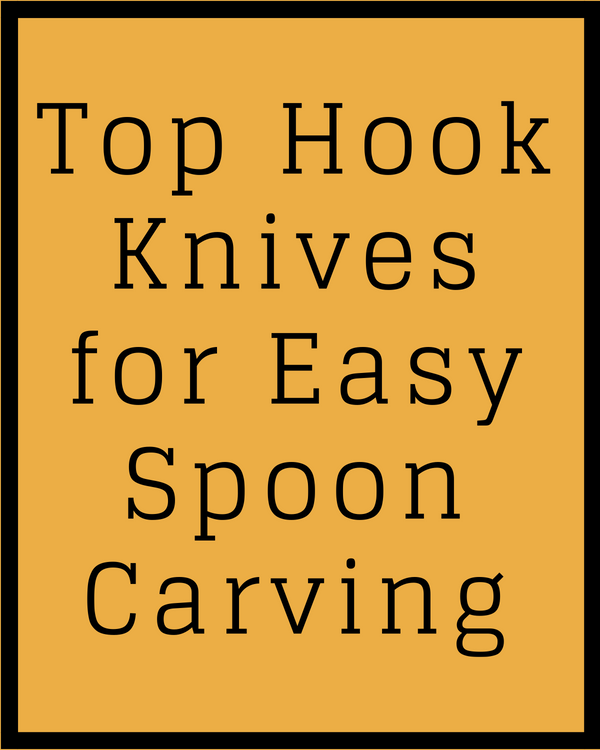 Traveling through the handle is a 3/4 tang high carbon steel blade that extends to 4.1″. Edging this medium sized multipurpose blade is a 22 degree angled bevel making it a Scandinavian grind. The biggest advantages this knife brings us are the 3/4 tang, steel type, Scandinavian grind, and the hard rubber handle to maneuver it all. Although, several of these key advantages also illuminate the faults in this knife. Here’s what they are and what to do about it. Knife tang is important for a very obvious reason: it determines reliability. In this mora companion mg review, you’ll see that the tang is quite reliable. Although it has a partial tang, a blade that doesn’t extend the full length of the handle, it won’t see any signs of loosening even with heavy wood work. The full tang extends through the handle, which means the blade is one solid piece and are pinned to the blade from each side. Usually, this is for strenuous and heavy activity. 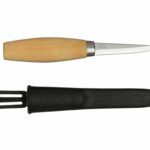 Mora companion mg uses a very useful high carbon steel that couldn’t be better for wood carving. I tested its strength by stressing it on some hardwoods to see if any significant deformities occurred, which to my pleasant surprise held up quite nicely. 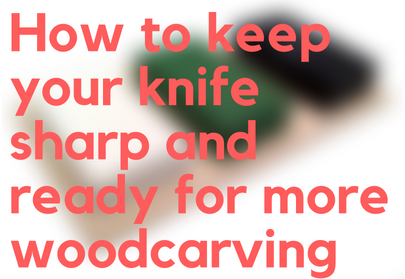 I recommend honing it every 20-30 minutes or so when wood carving. Also resists damage well when batoning, no cracks or chips when being put under strenuous activity so the hardness must be pretty high, not sure what it is exactly. No problems with edge resistance, something I always do is hone the knife I’m wood carving with every 20 minutes, helps to keep a consistent work flow and you really start to just knock projects out left and right when you really get the hang of it. It keeps the blade nice and healthy while reducing the risk of chipping and accidents from dull knives. Just like any other steel you leave in a moist environment for too long. Simply put: Your tools are only as good as you keep them. This means have a proper storage system in place for when you are finished carving so that your tools are not only where you left them, but also how you left them. How else can I avoid rust? Forcing a patina can help rust resistance to prevent your blade from corroding. Wood handles are what the majority of my knives use as handles but I’d be lying if I said the handle was uncomfortable in this mora companion mg review. It’s like batting with gloves on, I have such a strong grip around the handle that it feels like I can start hacking chunks of wood off a branch right away. I would watch out for chaffing however, chaffing leads to blisters and that’ll put you out of carving for a good minute until you heal. 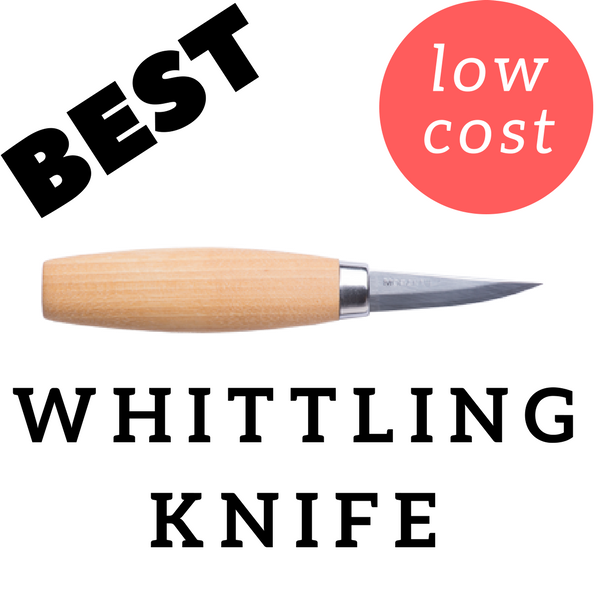 Great workability, easy to make various technical cuts with if need be but this knife is definitely more for heavy work. This mora companion mg review shows the significant advtanages with heavy work. 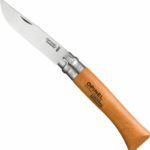 It’s 4.1″ carbon steel blade alone is best fit for heavy activity considering its toughness and hardness. On top of that, the 3/4 tang prevents it from giving in against the work applied. 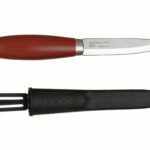 Swedish steel is incredibly durable and mora definitely has had a lot of time in crafting their perfect steel. The Scandinavian grind that angles at 22 degrees makes carving wood that much easier. Another feature that assists with the powerful blade is the rubber handle. It’s very comfortable even after hours of carving hardwood. 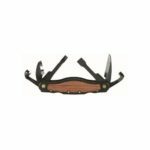 The hard rubber handle is a durable material even in multiple weather environments. The mora companion mg will exceed expectations you have and crush the doubts about it. Keep it in a nice dry storage to prevent rusting and force a patina for extra precaution. 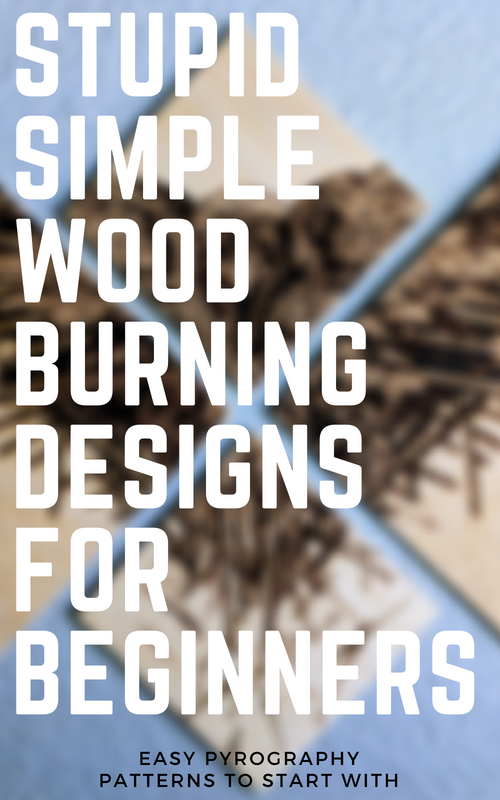 It’s especially great for work against hardwoods to assist larger projects.